Rather than simply picking one medium to master, April Martin Chartrand has gone so far as to completely create her own art form altogether. Her art form called “fiberalchemy,” is her attempt to find the most personal and accurate way of expressing herself. She uses extreme heat or cold to manipulate the texture of painted fabrics to create hardened, colorful sculptures. Chartrand has been using this technique to make anything from earrings and necklaces to hand fans and wall pieces. Aside from knitting, crocheting, clothing and her original art form, Chartrand also writes poetry, paints, and creates works of assemblage art. Nearly all of her artwork is heavily inspired by her travels around the world and her personal journey of trying to understand the greater legacy of colonialism and it’s impact on the African diaspora. Her journey however, began decades ago with a simple sewing machine. Growing up in Southern California with a stifling home life, Chartrand felt at a young age that she needed an outlet to express herself. She began messing around with her mother’s sewing machine, thus spurring a lifelong interest in knitting and pattern making. Chartrand would eventually move on to different styles of art as she got older. Chartrand’s personal expression serves as an example for today’s lack of overarching artistic zeitgeist. She has had no artistic training, in the traditional sense, nor has she ever been under the tutelage of other artists. Chartrand creates art explicitly for herself, and her particular art methods came about through experimentation, experience and genuine inspiration. Chartrand’s inner dialogue can be glimpsed through some of her more recent exhibitions, showcasing what she calls her “Treasured Cigar Boxes:” works of assemblage art nestled within old tobacco boxes. Using these boxes, Chartrand fills them and adorns them with artifacts and items found in many parts of the world that represent the legacy of colonialism’s effects on the African experience in the New World. She uses everything from gold and coinage to human hair and teeth. Chartrand’s “Treasured Cigar Boxes” have been shown in the San Francisco Public Library and currently, in the California African American Museum in Los Angeles. Aside from being passionate about her artwork, Chartrand is also driven in pursuing her graduate studies at SF State, where she hopes to earn a masters of science in college counseling and someday use the skills she’s learned in the art world to help college students tap into what inspires them. ArtworkSF is an art service that organizes art events and represents artists across the Bay Area. Chartrand’s organizational skills and multi-disciplined approach to art has proven invaluable for helping the organization, said Davis. Chartrand’s work in the art world has also touched her peers at SF State’s department of counseling. 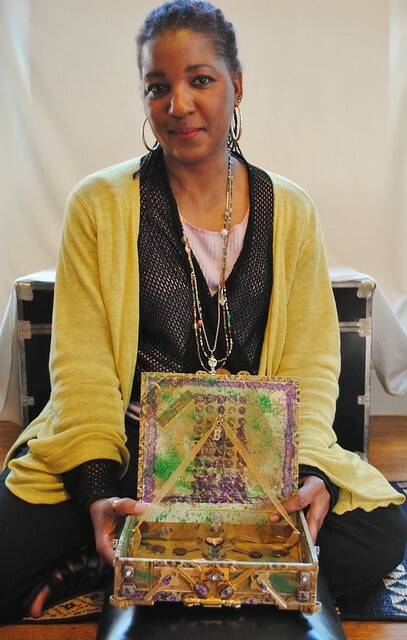 Chartrand’s “Treasured Cigar Boxes” can be viewed at the California African American Musem in Los Angeles until the end of March, 2013. This is so cool, keep it up.